There was a time when the term “Based on the Graphic Novel” was a rarity. In fact, the very idea of turning a comic into a film could stonewall your film career. That was a long time ago and times have changed. Not necessarily for the better. Now, you can base a film on a graphic novel that isn’t even released and was probably created as a tie-in in the first place, case in point: The Reverend. The film opens with Satan (Rutger Hauer) and God betting on the soul of a new reverend. The idea is interesting on paper, but fleshed out it's just plain dumb. It doesn’t help that “God” is played by a completely forgettable Ben Kingsley knock off – not very divine to say the least. The basic plot (and I do mean BASIC) concerns the new priest being bitten by a vampire (?!) who begins fighting evil like Blade, but without the sunglasses and Kung Fu! He takes in a Goth prostitute named Tracy (Emily Booth) and spends his time freeing her of the criminal element that controls her life. Yeah, that’s pretty much it. This film is riddled with problems. In fact, the opening set up creates a lot of the problems. A deal between God and Stan has a habit of raising expectations. This deal has no relevance on the film and only comes back into play as a half-assed bookend. Without this the film might be viewed in a better light, though it would still be bad, at least it wouldn’t be a letdown. Everything is left unfinished. The relationship that is created between the Reverend and the Whore blossoms and then disappears just like the bet. In fact, there aren’t a lot of things that are done in the course of 90 minutes. Director Neil Jones wants to create something fun and gruesome, but instead fumbles every scene and the finished product seems cobbled together from two different films like The Spookies. 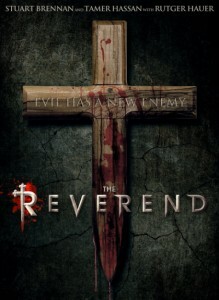 One of the first signs that the film is going astray is the Reverend’s initial attack. A young French woman reveals herself to be a vampire and bites him in a glorious effects ridden scene. It’s well done and holds out attention. That is literally the moment when things go wrong. He attacks her with a pointy cross that looks like it was specifically made to kill vampires in a cheesy Buffy kind of way, and worse yet, her staking is pantomimed in the most unconvincing way possible. Did they run out of effects budget at that point? The name cast is mostly wasted. You can have a star in the film in a two minute scene and have them steal the show. That doesn’t happen here. Rutger Hauer is interesting for like 5 seconds and Doug Bradley for even less. Emily Booth is charming as always and is the one bright spot in the main section of the film. I could go on and on about this terrible film, but I won’t. Simply avoid it. To give you an idea how bad it is, 1999’s Modern Vampires with Casper Van Dien is better. That’s saying something!